Frayed Denim Shorts - My name is Lovely! Now I can’t remember the last time I went to a festival, I am talking about ones where you spend the night. To be honest I’m not one for sleeping in tents or using the portable toilets its just not for me. I personally prefer concerts or day ones but thats just my preference. However, as my boys are growing up, too fast for my liking I know that the day will come when they want to go to these festivals, sleep in tents etc. I am going to pass that responsibility to my husband haha…no I’m only joking I think I will go with the boys just to have that experience with them. So when I look back in years to come I will remember the days with fond memories, having been able to spend the time with them. I’m not saying I will never go to a festival unless its when I get to spend time with my boys, but it has to appeal to me. At the moment the one festival that has somewhat of an appeal is Coachella, maybe because its in sunnier climate and has less of a chance of being down poured with rain! We shall wait and see if I go to one in the not so distance future! Here is my second look for the festival season. This is a favourite year after year, you simply can’t go wrong with a pair of high waisted frayed denim shorts. This pair is from Zara and is very comfortable and stylish as far as frayed denim shorts go. 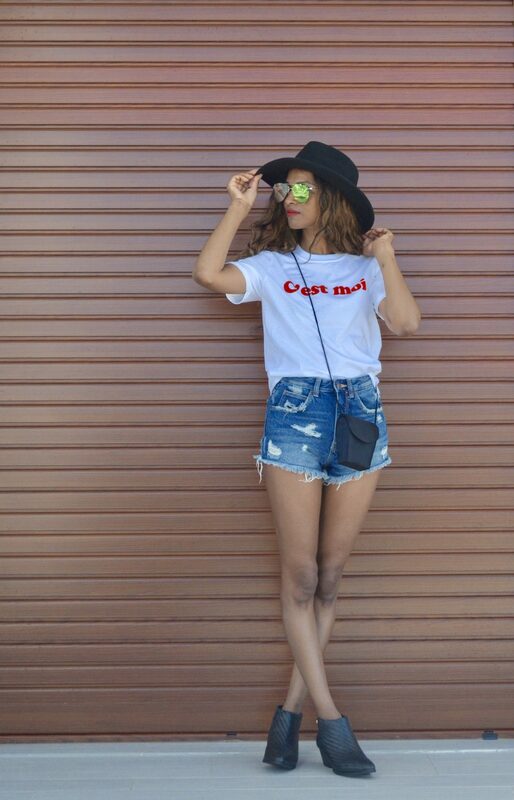 One of the easiest ways to style the outfit is to pair it with a slogan white T-Shirt. I have chosen this Tee from Topshop, I bought this as I loved the red velvet lettering. Simple with a touch of colour, I love how the red stands out against the white. I have paired the ensemble with my black Guess ankle boots, these are low heeled and ideal for walking around all day long. The black fedora hat from Whistles gives it that Boho chic vibe and is just a perfect pairing. Again you can change the boots for wellies depending on where the festival is taking place, also add a jacket if it is cooler too. A bralette and shirt: Pair your high waisted frayed denim shorts with a white bralette, there are plenty of options to choose from. From plain ones to laced ones so take your pick. Throw on a buttoned down denim shirt over your bralette. You can either tuck the shirt in or leave it out its up to you. This is a great combination and a firm favourite at Coechella! Add a cross body or a shoulder bag in the colour tan and some low heeled ankle boots in the same colour to finish the look. Find bralettes here at Asos, Topshop and Revolve. A Bardot top: High waisted black frayed denim shorts styled with a white Bardot top, works well too. Add a black trilby hat, some Vans or Converse trainers and a cross body bag to complete the look. Your all ready to party the day and night away. Find high waisted black shorts here at Asos, Topshop and Net-A-Porter. A body and Kimono: Go for a black bodysuit styled with some frayed black denim high waisted shorts. Then add a black laced Kimono on top and some gladiator sandals in black and voila your all ready to go! Find black body suits at Asos, Revolve and Net-A-Porter. 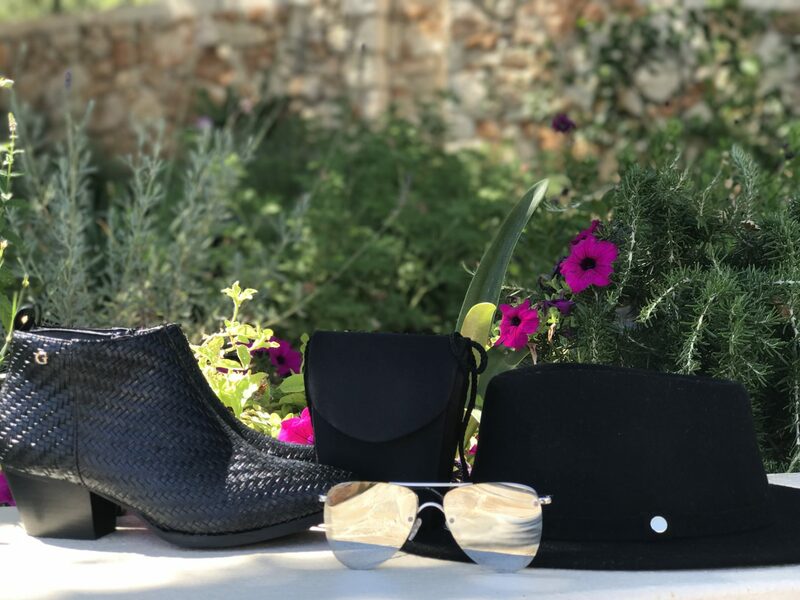 For the finishing touches I have styled my outfit with my vintage black trapeze shaped mini cross body bag and my Prince Limited Edition sunglasses from Le Specs to tie in the whole ensemble. Thank you for reading my fashion post, let me know what you think by leaving a comment below. How are you styling your frayed denim shorts? 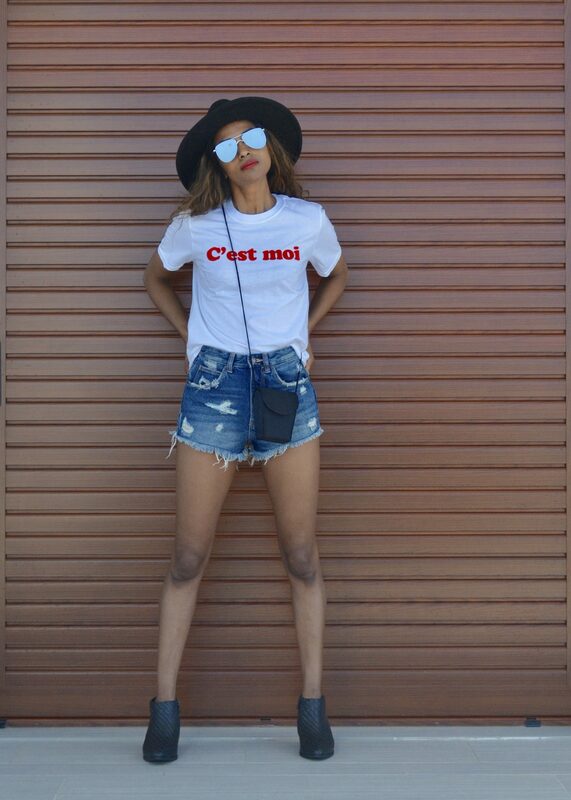 I am on the search of a pair of denim shorts and this blog came the right time for me. 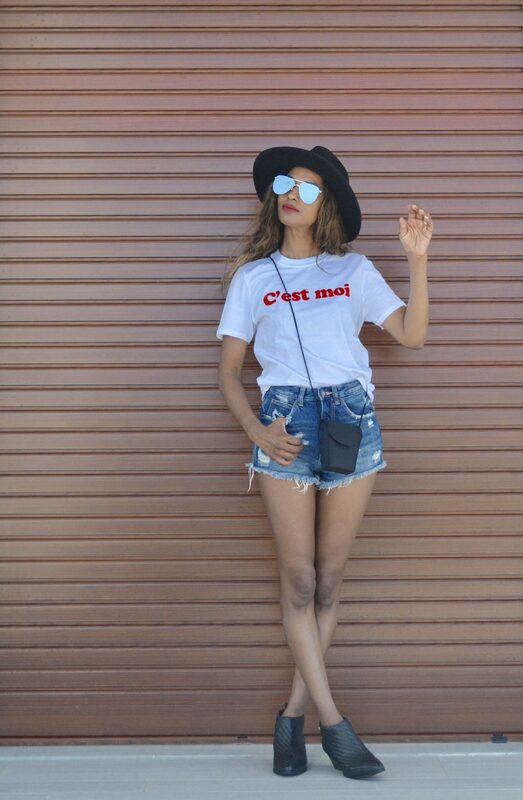 Love how you style the shorts with a simple tee and a panama hat! You rock this look lovely!